Layer (L) 2/3 pyramidal neurons in the primary somatosensory cortex (S1) are sparsely active, spontaneously and during sensory stimulation. Long-range inputs from higher areas may gate L2/3 activity. We investigated their in vivo impact by expressing channelrhodopsin in three main sources of feedback to rat S1: primary motor cortex, secondary somatosensory cortex, and secondary somatosensory thalamic nucleus (the posterior medial nucleus, POm). Inputs from cortical areas were relatively weak. POm, however, more robustly depolarized L2/3 cells and, when paired with peripheral stimulation, evoked action potentials. POm triggered not only a stronger fast-onset depolarization but also a delayed all-or-none persistent depolarization, lasting up to 1 s and exhibiting alpha/beta-range oscillations. Inactivating POm somata abolished persistent but not initial depolarization, indicating a recurrent circuit mechanism. We conclude that secondary thalamus can enhance L2/3 responsiveness over long periods. Such timescales could provide a potential modality-specific substrate for attention, working memory, and plasticity. Layer (L) 2/3 pyramidal neurons in the primary sensory cortices exhibit sparse activity, both spontaneously and in response to sensory stimuli (Barth and Poulet, 2012). Even in awake animals performing simple tactile detection tasks, L2/3 firing probability remains low (O'Connor et al., 2010). In the whisker representation (barrel cortex) of rodent primary somatosensory cortex (S1), sensory inputs during active whisking reliably evoke short-latency subthreshold depolarization in L2/3 pyramidal neurons (Crochet et al., 2011; Sachidhanandam et al., 2013). Sensory input also engages strong feed-forward inhibition, which keeps membrane potential (Vm) of most L2/3 neurons below spike threshold, rendering them quiet or only sparsely responsive (Crochet et al., 2011). Low firing rates in L2/3 are unlikely to be due to highly selective receptive fields: We recently showed that presenting complex spatio-temporal patterns of whisker stimulation optimized for individual neurons strongly engages neurons in L4-6, but not L2/3 (Ramirez et al., 2014). These previous studies suggest that ascending sensory information arriving in L2/3 from L4 alone may be insufficient to drive L2/3 activity. Excitatory inputs from other brain regions, perhaps activated under specific behavioral conditions, may be required to engage L2/3. L2/3 neurons in S1 receive inputs from higher-order cortical and subcortical regions, such as the primary motor cortex (M1) (Kinnischtzke et al., 2014; Lee et al., 2013; Petreanu et al., 2009; Veinante and Deschênes, 2003) and the secondary somatosensory nucleus of the thalamus, called the posterior medial (POm) nucleus (Jouhanneau et al., 2014; Lu and Lin, 1993; Ohno et al., 2012; Rubio-Garrido et al., 2009; Sherman and Guillery, 2011; Wimmer et al., 2010). Previous functional studies have mainly characterized the synapses from M1 or POm to S1 in vitro (Kinnischtzke et al., 2014; Lee et al., 2013; Petreanu et al., 2009). POm is known to be a potent driver of activity in secondary somatosensory (S2) in vitro (Theyel et al., 2010), and a recent in vivo study of anesthetized mice found that POm input could enhance the responsiveness of L5 pyramidal neurons to sensory stimulation (Mease et al., 2016). The response of the S1 L2/3 network to long-range synapses, particularly in vivo, has received little attention. Additionally S1 receives significant anatomical input from S2 (Cauller et al., 1998), whose effects remain largely unexplored. We hypothesized that L2/3 neurons, though typically silent, might respond to sensory stimuli in conjunction with inputs from higher-order brain regions. Such a circuit could contextually modulate sensory responses. To compare the potential impact of M1, POm, and S2 inputs on sensory processing, we combined optogenetic stimulation of their synaptic terminals with in vivo whole-cell recording in S1. We discovered that POm activation elicited significantly stronger depolarizations in L2/3 neurons than M1 or S2 activation. Only POm input was able to boost sensory responses of L2/3 neurons in both anesthetized and lightly sedated animals. Furthermore, we discovered that POm activation in awake and sedated animals elicited long-lasting depolarization in L2/3 in an all-or-none matter. These results demonstrate a potential circuit mechanism by which POm can enhance L2/3 processing during behavior for prolonged periods. To compare long-range M1, S2, and POm inputs to rat barrel cortex, we injected an adeno-associated virus expressing a fusion of channelrhodopsin (ChR2) and yellow fluorescent protein (YFP) into each of these three areas. Three to four weeks post-injection, there was intense ChR2-YFP expression in the infected areas (Figure 1A, bottom). In all cases, labeled axons were observed in barrel cortex, with significant innervation of L1. Outside of L1, axonal distributions across varied based on the area of origin (Figure 1A, top): POm axons were concentrated in L4 septum and L5A; M1 axons resided mostly in deep L5B and L6; and S2 axons formed bands in both L5 and L6 (Figure 1B). Axons from all three regions avoided L4 barrels and were rare in L3. No labeled somata were ever observed in barrel cortex, even after immunohistochemical amplification, ruling out retrograde infection of S1 neurons. Long-range projection axons from POm, M1 and S2 innervate Layer 1. (A) Top panel: labeling of long-range projection axons with ChR2-eYFP from POm (left), M1 (center), and S2 (right) shown in coronal sections of barrel cortex. Bottom: Sites of viral infection in POm (left), M1 (center), and S2 (right). Bar: 500 μm. D, dorsal; L, lateral. Dashes, pia. (B) Average laminar profile of ChR2-eYFP labeled axons in barrel cortex. Pixel intensity was measured only for barrel-related columns (not including septal regions) and normalized to peak (n = 4 rats for each infected region; shading,±SEM). To assess the relative efficacies of these long-range inputs to barrel cortex, we initially recorded whole-cell from L2/3 barrel cortex pyramidal neurons in anesthetized rats. We measured the postsynaptic responses evoked by photo-activation of ChR2-containing axons (Figure 2A). Photo-activation (a single 10 ms pulse) of long-range fibers near recorded neurons elicited either fast-onset excitatory postsynaptic potentials (EPSPs) or no discernable responses (example cells in Figure 2B). Photo-activation of POm axons elicited EPSPs in the majority of recorded neurons (21 out of 33 neurons; Figure 2C), which were substantial in size (mean ± SEM, 4.2 ± 0.8 mV). By comparison, M1 and S2 inputs produced significantly smaller responses in L2/3 pyramidal neurons (Figure 2C) (M1: 5 out of 19 neurons, 1.2 ± 0.48 mV; S2: 15 out of 22 neurons, 1.3 ± 0.28 mV; one-way ANOVA, p < 10-5= 0.006). Photo-activation of POm axons was also significantly larger when the full population of neurons, with and without EPSPs, were analyzed (POm: n = 33, mean ± SEM 2.7 ± 0.6 mV; M1: n = 19, mean 0.16 mV ± 0.22 mV; S2: n = 22, mean 0.87 ± 0.23 mV; one-way ANOVA, p = 0.0015; Figure 2C, D). POm axons more strongly excite L2/3 pyramidal neurons than M1 or S2 axons do. (A) Schematic of in vivo ChR2 activation of long-range projection axons in barrel cortex and whole-cell recording of L2/3 pyramidal neurons. Gray, L4 barrels. (B) Example whole-cell responses of three L2/3 pyramidal neurons to photo-activating long-range axons from infected cells in POm (top), M1 (middle), and S2 (bottom). Gray, 20 single trials recorded per cell; Colored, trial average. (C) Population average, baseline-subtracted responses of L2/3 pyramidal neurons to photo-activation of axons. Gray, average responses of individual neurons, n = 33 for POm, 19 for M1, and 22 for S2. Colored, average response for each input type. Baselines just prior to photo-activation have been aligned to allow visual comparison of responses. (D) Distributions of peak response amplitudes to photo-activation. Activation of POm axons on average elicits a significantly larger excitatory response than activation of M1 and S2 . One-way ANOVA, p=0.0015. N.S., not significant. (E) Distribution of baseline Vm of recorded L2/3 neurons. Baseline Vm did not differ among groups (one-way ANOVA, p=0.92). (F) Distribution of resting Rin of recorded L2/3 neurons. Resting Rin did not differ among groups (one-way ANOVA, p=0.85). Neurons recorded in POm-infected animals had baseline membrane potential (Vm; Figure 2E) and input resistance (Rin; Figure 2F) similar to those in M1- and S2-infected animals, indicating that the stronger POm input was not due to random variation in intrinsic properties among the three sampled groups. These Vm and Rin values are typical of L2/3 neurons in other in vivo whole-cell recording studies under similar conditions (Brecht et al., 2003; Constantinople and Bruno, 2011). Additionally, the kinetics of photo-activated EPSPs (onset latencies, rise times, and decay times) were similar across M1, S2, and POm experiments (Figure 2—figure supplement 1). Virus occasionally spread along the injection pipette track and into high-order visual thalamic nuclei LP and LD, superficial to POm (Figure 1A, bottom). These two nuclei, however, do not target barrel cortex (Kamishina et al., 2009; van Groen and Wyss, 1992) and are unlikely to explain our observations. Moreover, for animals in which multiple cortical neurons were patched, L2/3 cells with the strongest POm inputs could be observed in the same animals having cells receiving relatively weak POm input—up to 10 times smaller (Figure 2—figure supplement 2). This indicates that the strongest POm inputs are unlikely to result solely from variability in injection placement or viral efficiency and, conceivably, may reflect L2/3 cell variation. The greater potency of POm input relative to S2 and M1 input suggests a unique role in sensory processing. To compare the impact of each long-range input on sensory processing, we recorded L2/3 neuron responses to principal whisker (PW) stimulation, photo-activation of axons, or the combination of the two (Figure 3A). Delivery of the whisker stimulus preceded the light by 7 ms to account for known synaptic delay from the periphery to L2/3 and thereby maximize the coincidence of elicited potentials. Comparison of the combined stimuli and whisker stimulus alone showed that photo-activation of long-range axons from any of the three regions rarely suppressed sensory responses if at all (Figure 3B,D). Only POm projections (Figure 3B, red) ever facilitated L2/3 neuron input. Neurons without discernable excitatory responses to light alone (occurring in all three groups) showed no facilitation of sensory responses by photo-activation (gray circles) and are not analyzed further. In most cells, combined light and sensory stimuli elicited sub-threshold responses that were similar to the linear sum of the cell’s responses to each individual stimulus, suggesting that sensory input and each of these long-range inputs are linearly integrated passively by the L2/3 neurons (Figure 3C). This linearity also means that the enhancement of sensory response by light-induced input is directly proportional to the response to the light alone. An exception is the group of cells receiving the strongest POm inputs, which often exhibited sublinear integration (filled symbols) as expected from basic cellular properties (i.e., reduced driving force). L2/3 neurons in anesthetized animals lacked clear spiking responses to whisker stimuli as observed previously (Brecht et al., 2003). Nevertheless, these subthreshold results raised the possibility that POm may be an important controller of L2/3 activity under other conditions. Activation of POm inputs facilitates sensory responses of L2/3 pyramidal neurons. (A) Left, schematic of in vivo ChR2 activation of long-range projection axons and whisker stimulus during whole-cell recording from a L2/3 pyramidal neuron. Right, average response of an example neuron to photo-activation alone (red), deflection of the PW (black), and simultaneous photo-activation of POm axons and PW deflection (blue). Dotted line, linear sum of PSP response to PW deflection and photo-activation. Light blue bar: 10 ms laser pulse. (B) Photo-activation of POm inputs to L2/3 facilitates the neurons’ sensory responses. Filled circles, neurons for which the responses to the combined sensory and photo stimuli are statistically significantly greater than the sensory response alone. (C) L2/3 responses to simultaneous sensory and photo stimuli are linear. Line, linearity. Filled circles, neurons for which the responses to the combined sensory and photo stimuli are statistically significantly smaller than the sum of responses to sensory or photo stimulation alone. (D) Only photo-activation of POm axons significantly facilitates sensory responses of L2/3 pyramidal neurons (paired t-test: POm, n = 16, p=0.027; M1, n = 5, p=0.86; S2, n = 13, p=0.95). Dashed lines, cells for which whisker response and combined whisker and photo response are not statistically different. Solid lines, cell for which responses are statistically different. State is well known to impact the firing patterns of neurons in the central nervous system. Under anesthesia, POm neurons fire at lower rates than during wakefulness (Masri et al., 2008). Anesthetics may also directly alter synaptic properties. We therefore repeated the experiment using an alternative preparation in which local anesthetics are combined with administration of a frontally-acting opiate (fentanyl) to relax the animal. Previous studies have shown that cortical dynamics, intracellular membrane potential, and sensory responses recorded in this sedated preparation resemble those recorded in awake animals (Constantinople and Bruno, 2011; Simons et al., 1992). POm axons continued to induce substantial EPSPs in sedated animals, even larger than that found in urethane-anesthetized animals (Figure 4A, red). M1 axons were also significantly more effective under sedation (yellow), but did not reach the same potency as POm inputs. S2 inputs were similarly weak under both conditions. Despite the larger magnitude of POm input, the pathway appears to be engaging significant inhibition: Regression of initial POm input magnitude against baseline membrane potential predicts a reversal potential of −34 mV, suggestive of mixed excitation and inhibition and consistent with other inputs to L2/3 pyramids in vivo (Petersen et al., 2003). In summary, POm input appeared overall more potent relative to S2 and M1 inputs under very different states—both light sedation and general anesthesia. 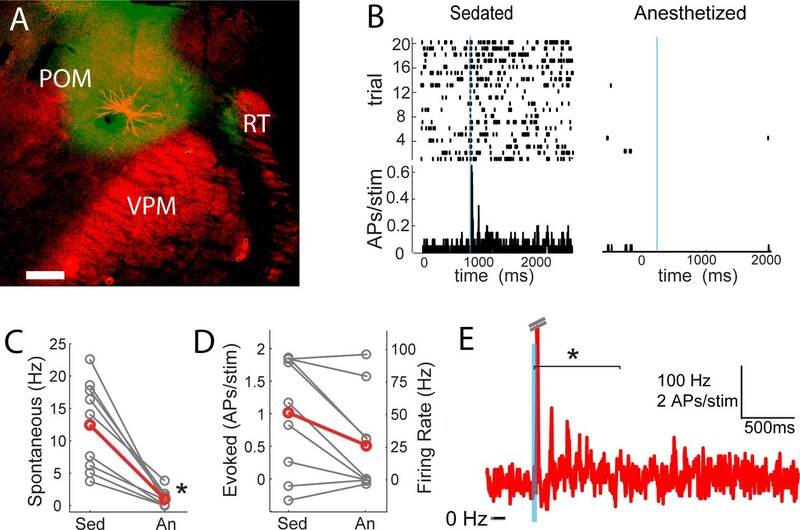 Strong excitation of L2/3 neurons by photo-activation of POm axons is not an artifact of general anesthesia. (A) Average L2/3 responses to photo-activation of POm and M1 axons under fentanyl sedation is larger than those measured under urethane general anesthesia (two-sided rank sum tests; POm, n = 15 fentanyl cells, mean ± SEM 5.5 ± 1.0 mV, p=0.004; M1,n = 8 cells, mean 3.1 ± 1.4, p=0.009; S2, n = 9 cells, mean 1.6 ± 0.4, p=0.13). Lines, means. (B) PSP amplitude (in response to POm activation) as a function of distance of L2/3 soma from center of nearest barrel column. (C) Under fentanyl sedation, neither POm (left) nor M1 axon activation (middle) significantly boosted subthreshold whisker responses (paired t-tests; n = 12, p=0.16 and n = 7, p=0.07 respectively) despite slight appearances of trends. S2 axon activation (right) did not significantly boost the subthreshold whisker responses (n = 7, p=0.83). Gray, individual cells; Red, mean. (D) Left: Under fentanyl sedation, POm axon activation significantly increase spiking responses of L2/3 neurons to whisker deflection (paired t-test, n = 12, p=0.018). Middle: M1 axon activation does not significantly increase spiking responses of L2/3 neurons to whisker deflection (n = 7, p=0.36). Right: S2 axon activation does not significantly increase spiking responses of L2/3 neurons to whisker deflection (n = 7, p=0.37). Gray, individual cells; Red, mean. Some data points have the same values (i.e., 0). (E) Population PSTH of spiking responses of L2/3 neurons to whisker deflect (black) and whisker deflection combined with POm axon activation (red), n = 12 neurons. Gray line: displacement of whisker stimulus. Blue bar: duration of photostimulation (when present). POm is directly adjacent to VPM, the primary thalamic nucleus for this system. The spread of infection into VPM is a potential confound. We measured the area of the POm infection in the section where the infection was largest, which is approximately the infection center. POm infections were an order of magnitude larger in cross-sectional area than any potential VPM contamination. PSP amplitude correlated with the size of the infected region in POm, not the one in VPM (Figure 4—figure supplement 1). Additionally, we observed no statistically significant relationship of POm input magnitude and recording depth from the pia (regression, p=0.18), indicating that L2 and L3 pyramids were similarly affected by photo-activation even though L3 pyramids are more likely than L2 pyramids to receive VPM input. Thus, intentional POm infection rather than unintended VPM contamination appears to account for the bulk of the synaptic input we measured. Another possible explanation for the relative potency of POm input is the presence of POm axons in the septum between barrels (Figure 1A, left). If septal branches explained the stronger POm input, L2/3 pyramidal neurons closer to septa would be expected to receive stronger POm inputs because L4 axons tend to arborize directly superficial to their somata. We tested this possibility by measuring the horizontal distance of L2/3 somata from the center of the nearest barrel column. There was, however, no relationship of distance to the magnitude of POm input (Figure 4B; R2 = 0.06, p=0.4), suggesting that septal innervation is not a major contributor to POm’s relative potency. This result is consistent with anatomy: all individual POm axons reconstructed to date branch extensively in L1 but have few or no branches in the septum that they traverse to reach L1 (Deschênes et al., 1998; Ohno et al., 2012). Additionally, a single POm axon often ascends the septal spaces between more than one pair of barrels. Thus, a large number of unbranched axons are concentrated in the small septal volumes, potentially explaining why PSP size does not reflect high septal epifluorescence. We did not detect any statistically significant enhancement of L2/3 neurons’ responses to whisker stimulation by S2 or M1 axon stimulation (Figure 4C,D). Photo-activation of POm inputs appeared to slightly boost the sub-threshold responses of L2/3 pyramidal neurons to PW stimulation under sedation (Figure 4C) as under general anesthesia, but reached only trend-level significance. 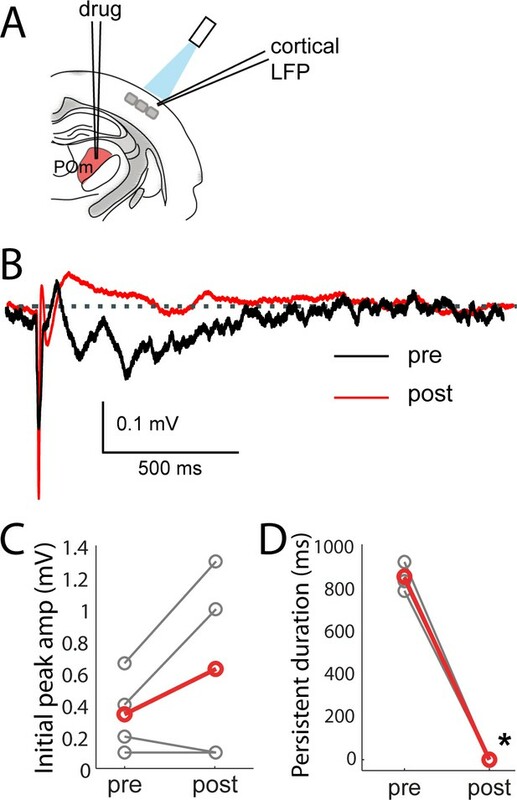 However, this slight subthreshold increase translated into substantial increases of suprathreshold (spiking) responses of those L2/3 neurons to sensory stimuli (Figure 4D,E). Spiking responses were increased six fold (mean ±SEM, whisker stimulus alone: 0.16 ± 0.09 Hz; whisker +light: 1.1 ± 0.36 Hz). Such large enhancements in spiking are expected from small increases in subthreshold input due to the nonlinear nature of spike generation. Sublinear integration of POm input that remains net facilitatory mirrors the sublinear, net facilitatory effects we have previously shown for sensory surround stimulation (Ramirez et al., 2014). We conclude that, of several long-range pathways innervating primary somatosensory cortex, POm input is relatively more potent to L2/3 pyramidal neurons than S2 or M1 inputs. Our results suggest that POm may be gating L2/3 suprathreshold sensory responses. The time course of L2/3 responses during POm activation is also unique. In anesthetized animals, PSPs induced by photoactivation of POm inputs return to baseline 50–100 ms after the cessation of light stimuli (Figures 2 and 3) as recently observed (Gambino et al., 2014). In sedated animals, we discovered a persistent depolarization in L2/3 pyramidal cells lasting an order of magnitude longer (Figure 5A). After the initial fast-onset EPSP and a period of pronounced inhibition, persistent depolarization began ~150 ms after POm axon activation (mean onset, 163 ± 13 ms) and typically continued for up to one second (mean duration, 758 ± 133 ms; Figure 5B, red). For each neuron recorded, ~80% of trials showed a prolonged response, which was unseen in anesthetized animals. M1 and S2 inputs did not elicit persistent depolarization (yellow and blue). Only POm inputs elicit large late, persistent depolarization in L2/3 neurons under fentanyl sedation. (A) Example recording (single trial) of a L2/3 pyramidal neuron’s response to a 10 ms laser pulse (blue) stimulation of POm axons during fentanyl sedation. (B) Population average of L2/3 response to POm, VPM, M1, and S2 input under fentanyl sedation (POm, n = 15 cells; VPM, n = 10 cells; M1, n = 8 cells; S2, n = 9 cells). Gray, average responses of individual neurons; Colored, population average. Baselines just prior to photo-activation have been aligned to allow visual comparison of responses. (C) Power-spectrum of persistent period (colored) vs. spontaneous period (black) in whole-cell recordings. Shading, 95% confidence bands computed using the Jackknife. To check whether the different time courses of POm, M1, and S2 were a trivial consequence of POm’s stronger input, we recorded from animals in which we infected the primary thalamic nucleus (VPM). 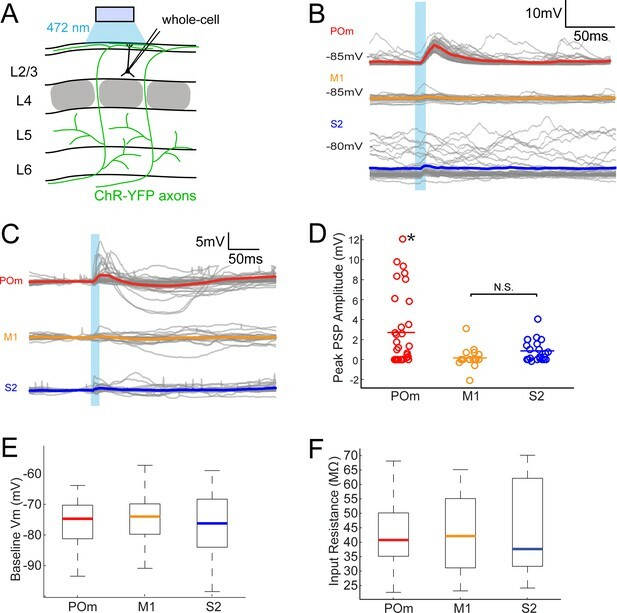 VPM is an even more powerful driver of S1, including L4 excitatory neurons, which are themselves highly active and mainly target L2/3 basal dendrites (Bruno and Sakmann, 2006; Egger et al., 2008; Lübke et al., 2003; Viaene et al., 2011a). Strikingly, axons from VPM elicited little or no persistent depolarization in L2/3 (green), despite generating large initial responses (13.4 ± 3.2 mV; n = 9) that were on average 7-fold larger than those elicited by POm. Thus, persistent depolarization of cortex appears to be a unique capability of secondary thalamus, rather than being a consequence of the magnitude of input generated by a pathway. On individual trials, the persistent depolarization showed clear periodicity in the 10–20 Hz frequency band (Figure 5A,C, red). Signals in the 10–20 Hz range were absent from corresponding times during VPM, M1 and S2 axonal photo-activation (green, yellow and blue) as well as spontaneous activity (black). Thus, ‘alpha’ (8–15 Hz) and ‘beta’ range (12.5–30 Hz) oscillations in cortex appeared to be unique to stimulation of POm axons. The persistent depolarization is also detectable in L2/3 recordings of local field potentials (LFPs), which have inverted polarity relative to whole-cell recordings (compare Figure 6A,B). We exploited the LFP to explore how other conditions might influence responses to POm. In our initial experiments (Figures 2–5), we had used high light intensity to ensure that the weak responses of M1 and S2 were real. Varying light intensity over 0.1–35 mW, we found that the persistent depolarization elicited by POm axons appeared at all intensities that evoked an initial response (Figure 6D). Whereas the initial peak scaled with light intensity (Figure 6E, top), the persistent depolarization was virtually all-or-none (middle), appearing with as little as 0.6 mW. The all-or-none quality of the depolarization raises the possibility that POm may not exist to provide strong, precise input to L2/3, but rather to enhance L2/3 activity over long time windows. POm elicits an all-or-none persistent depolarization in L2/3 during wakefulness. (A) Population average of L2/3 whole-cell response to POm during fentanyl sedation (n = 15 cells). Gray, average responses of individual neurons. Red, population average. Baselines just prior to photo-activation have been aligned to allow visual comparison of responses. (B) L2/3 LFP response to POm inputs recorded in fentanyl sedated rats (n = 7 rats, 40 trials/rat). Gray, average responses at each recording site. Red, population average. (C) L2/3 LFP response to POm inputs recorded in awake rats (n = 4 rats). Gray, average responses at each recording site. Red, population average. (D) Example L2/3 LFP responses to POm stimulation with different levels of light intensity, recorded under fentanyl sedation. (E) Top: LFP initial peak amplitude vs. light intensity, normalized to responses induced by highest light intensity. Middle: LFP persistent peak amplitude vs. light intensity, normalized to responses induced by highest light intensity. Bottom: LFP persistent area vs. light intensity, normalized to responses induced by highest light intensity. Gray, average response for each rat. Red, population average (n = 3 rats; errorbar, SEM). To verify that the persistent depolarization produced by this pathway is relevant for awake animals, we recorded LFPs in L2/3 of awake head-fixed rats. LFP responses to POm in awake rats showed the same characteristic initial and persistent depolarization (Figure 6C) seen in sedated animals (Figure 6B). We conclude that during wakefulness POm is able to open an unusually long window of L2/3 depolarization. POm may not only trigger but also sustain the persistent depolarization. We tested this by juxtasomally recording from individual POm neurons while photo-activating their thalamocortical axons in barrel cortex (Figure 7A). Because the persistent depolarization was seen in L2/3 in sedated but not anesthetized animals, we first compared POm spiking responses under sedation alone and with the volatile general anesthetic isoflurane (Figure 7B). We have previously used a similar strategy in order to rapidly alter the preparation and study individual cells under both conditions (Constantinople and Bruno, 2011). Spontaneous discharges of the POm neurons decreased more than ten-fold when anesthesia was induced (sedated mean ±SEM, 13.2 ± 8.7 Hz; anesthetized mean ±SEM, 1 ± 1.3 Hz; paired t-test, p=8 × 10−4; Figure 7C). The activity observed here during isoflurane-induced anesthesia is similar to that for urethane-anesthetized rats (Masri et al., 2008). Antidromic POm spiking responses to photostimulation were slightly but not significantly higher under sedation (paired t-test, p=0.09; Figure 7D). Given that POm synapses facilitate (Viaene et al., 2011b), suppressed POm spiking during anesthesia readily explains the smaller fast-onset PSPs compared to sedation (Figure 4A). POm spiking mirrors L2/3 depolarization dynamics during anesthesia and sedation. (A) Morphologically recovered POm neuron recorded and filled juxtasomally in vivo. Red, biocytin-Alexa594. Green, ChR2-YFP. (B) Raster plot (top) and PSTH (bottom) of a POm neuron’s response to photo-stimulation of ChR2-containing cortically-projecting axons. Left, POm cell recorded under sedation; Right, same cell under isoflurane-induced anesthesia. Blue line, 10 ms laser stimulation. (C) POm spontaneous activity is significantly lower under anesthesia than under sedation (paired t-test, n = 9, p=8×10−4). Gray, individual cells; Red, mean. (D) Photo-activation of POm cortically-projecting fibers elicits more antidromic spikes in POm under sedation than anesthesia (paired t-test, n = 9, p=0.091). Peak firing rate is baseline-corrected by subtracting spontaneous firing rate measured in the pre-laser period. Gray, individual cells; Red, mean. (E) Population PSTH of POm neurons that displayed persistent activation under sedation (n = 5). Each cell displays significant higher firing rate than baseline (t-test, p<0.01) during the persistent period (0–800 ms post light stimulation, indicated by the bracket). Dashes, peak truncation for clarity. Consistent with POm generating the persistent depolarization in L2/3, five out of nine POm neurons exhibited persistent spiking responses to brief light activation of their terminals that was statistically (p<0.01) greater than spontaneous activity (Figure 7E). Nevertheless, long-lasting depolarization of L2/3 could conceivably be generated without somatic spiking of POm, such as by sustained axonal discharges (Sheffield et al., 2011) or recurrent circuits within cortex. To verify that delayed persistent depolarizations in L2/3 are truly POm-dependent, we recorded L2/3 LFP responses to light while silencing POm somata with 10% lidocaine or 1 mg/ml muscimol injected in POm (Figure 8A). We found that the initial response in L2/3 remained intact and may have even grown during inactivation (Figure 8B,C), perhaps due to relief from POm-driven cortical inhibition. The delayed persistent depolarization, however, was abolished upon inactivation (Figure 8B,D), ruling out potential artifact of channelrhodopsin activation of POm-S1 axon terminals. Moreover, this result demonstrates that the delayed persistent depolarization in L2/3 is generated through recurrent circuitry involving POm, rather than a synaptic mechanism or a purely intracortical mechanism. Persistent depolarization of L2/3 requires sustained POm firing. (A) Schematic of POm inactivation experiment. POm fibers are photo-activated while cortical LFP is recorded, before and after injection of 10% lidocaine or 1 mg/mL muscimol through a pipette in POm. (B) Population average of L2/3 LFP responses to POm input pre (black) and post (red) inactivation (n = 4 rats, 40 trials/rat). (C) Pharmacological inactivation slightly increased the magnitude of initial response in L2/3 (paired t-test, n = 4 rats, 40 trials/rat, p=0.24). Gray, individual animals; red, population average. (D) Persistent depolarization in L2/3 was abolished by POm inactivation (paired t-test, p<10−4). Gray, individual animals; red, population average. L2/3 pyramidal neurons in the rodent barrel cortex are sparsely active under a large range of conditions, including when awake animals perform simple tactile tasks. This suggests that bottom-up sensory information from the periphery is insufficient to strongly drive L2/3 neurons, possibly resulting in a sparse code for tactile information. Alternatively, additional inputs such as long-range inputs from various higher order cortical and subcortical regions may be needed to unleash L2/3 activity. POm, M1 and S2 have axons that ramify in L1 of barrel cortex and overlap with apical dendrites of L2/3 pyramidal neurons. All three areas could potentially ungate L2/3 activity. In spite of this, M1 and S2 inputs were relatively weak, having little impact on L2/3 pyramids. Only POm inputs appeared sufficient to drive L2/3 neurons and boost their sensory responses. Additionally, our study provides a direct anatomical comparison of these three long-range projections. The overall laminar distributions of POm, M1, and S2 projections to barrel cortex here are consistent with previous studies of the individual projections (Kinnischtzke et al., 2014; Minamisawa et al., 2018; Ohno et al., 2012; Veinante and Deschênes, 2003; Wimmer et al., 2010). We found that these three areas differ in their infragranular targets. POm, S2 and M1 axons together cover the infragranular layers, from their most shallow depth in L5A to their deepest in L6B. Of note, the S2 zone appears to correspond to the region of L5/6 that lacks POm and VPM innervation (Wimmer et al., 2010). These results suggest that within L5 and 6, there potentially exist multiple sub-layers that receive and integrate information from different cortical and subcortical regions. For both our functional and anatomical results, an important question is the extent to which we sufficiently infected source regions. The whisker representations in POm and S2 are similarly small (~0.5 mm wide) and have known locations, lateral of VPM and S1, respectively (Carvell and Simons, 1987; Fabri and Burton, 1991a; Fabri and Burton, 1991b; Kwegyir-Afful and Keller, 2004). Our single-track multi-bolus methods of infecting POm and S2 readily achieved ChR2 expression over this spatial extent. Additionally, POm and S2 axons arborize broadly in S1 across many columns and are similarly loosely topographic (Minamisawa et al., 2018; Ohno et al., 2012). If only a very specific location within S2 were capable of input similar in magnitude to POm, one would have expected large S2 inputs in at least a subset of our experiments, but such S2 magnitudes were never observed. Neither geometry nor connectivity appears likely to account for our POm and S2 results. M1 is a large structure, but again the whisker-associated areas of M1 are smaller in extent. Pilot experiments initially exploited physiological mapping techniques to optimize M1 infection (see Materials and methods), but these produced the same small M1 inputs as stereotaxic injections. We therefore blanketed M1 with multiple multi-bolus tracks during stereotaxic virus delivery. Whereas we had to avoid contaminating VPM and S1 in the case of POm and S2, we could afford to infect larger frontal areas, potentially beyond M1, to ensure that virtually all of M1 was expressing ChR2. Despite the larger volumes of our M1 infections, POm inputs exhibited the larger amplitudes. Further studies are nonetheless needed to explore select thalamic sub-regions or cortical cell types and to test whether they differ in influence on sensory processing. POm may contain multiple anterior and posterior subnuclei that preferentially innervate L5 versus L1 of barrel cortex, respectively (Ohno et al., 2012). Similarly, M1 cortico-callosal cells send axons which ramify in both L1 and L5/6 of barrel cortex, whereas corticofugal cells send more collaterals to L1 of barrel cortex (Veinante and Deschênes, 2003). It is unknown if these subregions and cell types are always active at the same time. Our anatomical and physiological data likely mixed the two pathways, both the L1- and L5/6-preferring projections. Additionally, L2/3 has been suggested to contain separate subcircuits that are active at behaviorally distinct times (Chen et al., 2013), and such subcircuits may be more strongly or weakly targeted by POm. Indeed, POm is known to provide greater synaptic input to the most active L2/3 cells (Jouhanneau et al., 2014). Consistent with the stronger POm effect we observed, a previous study of primary visual cortex in anesthetized primates found that pharmacological activation of pulvinar, the visual analog of POm, could enhance L2/3 neuronal responses to visual stimuli (Purushothaman et al., 2012). Also in line with the weak M1 impact here, M1 is known to strongly activate inhibitory neurons in L2/3 of barrel cortex (Kinnischtzke et al., 2014; Lee et al., 2013; Zagha et al., 2013). Locomotion enhances L2/3 responses in mouse V1 and suppresses primary auditory cortex, but these effects may involve neuromodulation of cortical inhibitory cells as opposed to direct M1 excitatory synapses on L2/3 pyramidal neurons (Fu et al., 2014; Zhou et al., 2014). There has been limited investigation of S2 inputs to barrel cortex. We found that S2 provides only minor depolarizing inputs to L2/3 pyramidal neurons, perhaps slightly stronger than the contribution of M1. A recent study suggests that S2 feedback had little or no effect on overall discharges of L2/3 units in S1 and may be more useful for modulating directional tuning of S1 neurons (Minamisawa et al., 2018). Long-range inputs have been suspected of enhancing sensory processing via dendritic nonlinearity. Coincident activation of apical and basal dendrite inputs to L5 neurons can engage large calcium spiking events in vivo, which results in supralinear integration (Xu et al., 2012). We observed only linear and sublinear summation of potential top-down inputs (POm, M1, S2) with bottom-up sensory signals (whisker stimuli) in L2/3 pyramidal neurons, suggesting the absence of voltage-gated calcium spikes in their dendrites. This conclusion is consistent with recent imaging studies of L2/3 cells in S1 and V1 that found sensory stimulation produces sparse local dendritic ‘hot spots’ but not global events (Palmer et al., 2014). Linear summation also indicates that L4 sensory inputs and POm inputs likely innervate separate dendritic compartments of L2/3 cells, whereby local depolarization by one group of synapses minimally affects the local driving force and input resistance of another dendritic compartment. This type of summation is consistent with L4 axons mainly innervating L2/3 basal dendrites over apical tufts (Lübke et al., 2003) and POm preferentially synapsing on L1 apical tufts over basals (Petreanu et al., 2009). Several possible mechanisms could explain how POm exerts stronger influence than S2 and M1 over L2/3 pyramidal cells even though they all innervate L1 to roughly the same degree. First, POm synapses onto L2/3 cells could simply be stronger. However, slice studies of the individual pathways using optogenetic stimulation have not revealed a major difference between M1- and POm-evoked currents (Audette et al., 2018; Kinnischtzke et al., 2014), though these pathways have yet to be directly compared in vitro. Second, differences in their subcellular locations could conceivably lead to selective engagement of the nonlinear mechanisms mentioned above. High-throughput light microscopy approaches would be useful for scanning whole apical tufts to assess possible differences (Chandrasekaran et al., 2015; Schoonover et al., 2014). Third, POm selectively targets 5HT3AR inhibitory cells and in vitro evokes particularly delayed inhibition in L2 relative to excitation (Audette et al., 2018). The delayed inhibition affords POm an unusually long window of integration in cortex. M1 and S2 might target other inhibitory cell types, endowing them with more typical, short integration windows. POm activation could persistently depolarize cortical L2/3 pyramidal neurons for up to about 1 s. One possible explanation is that our photo-activation protocol induces a barrage of action potentials generated locally in the POm axons in cortex rather than by the axon initial segment near the POm somata. Axonal barrage firing has been observed in hippocampal and cortical interneurons (Sheffield et al., 2011; Suzuki et al., 2014). Another possibility is that persistent depolarization is generated by recurrent circuitry within L2/3 or between L2/3 and L5. Our pharmacological inactivation of POm indicated that activation of POm somata is necessary for generating persistent depolarization in the cortex. This rules out both axonal barrage firing and purely intracortical circuit mechanisms. Since POm cells have little or no recurrent connectivity with one another (Deschênes et al., 1998; Ohno et al., 2012), the persistent firing of POm is likely due to a loop involving POm and one or more other structures. We observed a characteristic alpha/beta-range oscillation in the persistent depolarization, which is reminiscent of oscillations such as sleep spindles, which are generated through interactions between primary thalamic relay cells and the reticular inhibitory neurons (von Krosigk et al., 1993). The persistent depolarization we observed may be produced by similarly reciprocally connected structures, such as POm and possibly cortical layer 5/6 and/or the thalamic reticular nucleus, perhaps with some contribution of zona incerta. Indeed POm input can prolong suprathreshold whisker response of L5 cells on a similar timescale in isoflurane-anesthetized mice (Mease et al., 2016). The POm input to the cortex might then act directly through projections on excitatory cells as well as indirectly through inhibitory neurons, which contribute to visual cortex oscillations overlapping the beta frequency range (Veit et al., 2017). Recent modeling work demonstrates that brief bursts of apical tuft input combined with broad proximal dendrite input may contribute to beta oscillation generation (Sherman et al., 2016), and POm synapses are anatomically positioned to exploit precisely such a mechanism. POm activity increases during active movement (Moore et al., 2015; Urbain et al., 2015), which may be a key condition for inducing these long-lasting depolarizations in L2/3 during behavior. The functional consequences of the persistent depolarization are potentially important for both plasticity and perception. POm might not only permit L2/3 response to sensory stimulation, but also sensitize L2/3 for prolonged periods thereafter. First, POm was recently shown to facilitate an NMDA-dependent plateau potential that can induce synaptic long-term potentiation in layer 2/3 without somatic spikes for a period on the order of ~100 ms following the stimulus (Gambino et al., 2014). Second, whisker contact alone in an awake mouse does not persistently depolarize L2/3, but, with training on a simple tactile detection task, a prolonged secondary depolarization of unknown origin emerges. This late depolarization correlates with behavioral choices and a small increase of L2/3 firing rates (albeit still sparse), and optogenetic inhibition of barrel cortex during this time period interferes with performance (Sachidhanandam et al., 2013). The time courses of the late depolarization during behavior and our POm axon stimulation results are similar, suggesting a possible POm substrate. This also raises the question of whether POm activation of cortical neurons is crucial for perception of sensory stimuli. There are multiple possibilities for how excitation might flow through these circuits. Suppressing barrel cortex activity abolishes the responses of POm neurons to whisker stimulation (Diamond et al., 1992). This might have suggested a simple latching scenario, in which barrel cortex activates POm via L5 descending axons and then POm persistent firing provides feedback that sustains cortical activity. However, we found that persistent depolarizations of L2/3 via POm were absent during anesthesia. Additionally, our results and others have shown that overall POm activity is highly elevated during wakefulness (Masri et al., 2008; Urbain et al., 2015), possibly due to cholinergic regulation of zona incerta inputs to POm (Masri et al., 2006). An alternative possibility then is that persistent POm input to L2/3 has multiple triggers. In addition to synapses from trigeminal brainstem and S1, POm receives connections from motor cortex and posterior parietal cortex in multiple species (Neylon and Haight, 1983). During active behavior, any of these inputs might conceivably trigger persistent firing in the now more excitable POm circuit, which then prolongs a window of enhanced cortical responsiveness even when there was no preceding sensory stimulus. This could support multiple behaviors. Secondary thalamic nuclei, such as POm and pulvinar, have been postulated to be important intermediaries of communication between cortical areas (Sherman and Guillery, 2011), subserving sensory-motor associations and other high-order aspects of sensory behavior. Lesion studies in non-human primates as well as humans have demonstrated that pulvinar is important for selective attention in visual search (Bender and Butter, 1987; Ungerleider and Christensen, 1979; Ward et al., 2002; Wilke et al., 2010). Behavioral studies further demonstrated that responses of pulvinar neurons are stronger when stimuli are presented within an attended region of visual space (Petersen et al., 1985). Pulvinar neurons corresponding to the attended location also fire tonically at elevated levels prior to stimulus presentation, suggesting that pulvinar may be involved in allocating spatial attention and/or maintaining working memory (Saalmann et al., 2012). This elevated activity might reflect the engagement of an intrathalamic or thalamocortical loop as we evoked in POm by channelrhodopsin stimulation. Intriguingly, activity in pulvinar and visual cortical areas is highly coherent in beta-range frequencies (Saalmann et al., 2012) similar to those we observed (Figure 5). Our results raise the possibility that beta oscillations may be a general cortical signature of interactions with secondary thalamus. Few analogous behavioral studies have been done to elucidate the functional role of POm. One behavioral study concluded that POm lesions do not affect an animal’s ability to detect passive deflection of a single whisker (Narumi et al., 2007). However, POm may be primarily engaged during active sensing with multiple whiskers given its large receptive fields and tight reciprocal connections with M1 and S1 (Diamond et al., 1992; Groh et al., 2014; Groh et al., 2008; Miyashita et al., 1994; Trageser and Keller, 2004). Physiological studies have demonstrated that POm sensory responses can be significantly boosted by the presence of neuromodulators (Masri et al., 2006), thus raising the possibility that POm activity could be strongly modulated by attention. Additionally, subsets of POm neurons are highly responsive to noxious stimuli (Masri et al., 2009). However, rather than selectively representing pain, POm may respond to any stimuli of high behavioral salience. Secondary sensory nuclei in thalamus may enable encoding of such high-order contextual information during behavior (Saalmann et al., 2012) via the long-lasting input they provide to L2/3. This may render L2/3 sensitive to conjunctions of sensory and contextual inputs and provide an eligibility trace enabling plasticity over behavioral timescales. All procedures were approved by the Institutional Animal Care and Use Committee at Columbia University (protocols AC-AAAD0960 and AC-AAAF9003). To photo-activate long-range projection fibers, female ~70–100 g Wistar rats (Charles River) were injected with adeno-associated virus (AAV1) to express a ChR2-eYFP fusion protein driven by the human synapsin promoter (AAV1.hSyn.ChR2(H134R)-eYFP.WPRE.hGH, U.Penn Vector Core). Note that effects or effect sizes could conceivably differ for male rats. Standard aseptic technique was used. Rats were anesthetized with isoflurane (1–3% in O2) and placed in a stereotax using blunt earbars. Pre-emptive systemic analgesia was administered (carprofen, 5 mg/kg, subcutaneous). Ophthalmic ointment was applied to the eyes. Rectal body temperature was maintained at 37°C with a heating pad. A small incision was made in the scalp to expose the skull overlying the target structure. The skull was thinned with a dental drill. Craniotomies were placed stereotaxically: M1, 1.5–2.5 mm anterior to bregma and 1–2.5 mm lateral from midline (injections 500–1500 μm beneath the pia); S2, 2–3 mm posterior and 6–6.5 mm lateral (1500–2000 μm); and POm, 2.5–3.5 mm posterior and 2.5–4.0 mm lateral (4500–5000 μm). VPM was targeted by physiologically locating its C and D whisker row representations and injecting at approximately this location. POm was targeted by injecting 700 μm medial of those VPM representations. Injections were made to achieve similar coverage of each of the four structures, which have different geometry. For M1, four different injection tracts spaced 500 μm apart in a square pattern were used. For each tract, a 40–60 nl volume was ejected at depths of 1500, 1000 and 500 μm from the pia, for a grand total of 12 injections. Only one injection tract was made through S2, POm, and VPM, which are smaller than M1. POm received only two 40 nl ejections at two depths 300 μm apart along a single injection tract, as did VPM. S2 received three injections at depths of 1500, 1000 and 500 μm along its single injection tract made at the stereotaxic site. Virus was injected over ~20 min using a Nanoject II auto-nanoliter injector (Drummond, Broomall, PA). The craniotomies were covered with bone wax, and the incision closed with absorbable sutures. Animals were allowed to recover from surgery in a clean cage with softened food palettes and water overnight before returning to their home cage. Because M1 is larger than POm and S2, we attempted to refine M1 injection locations based on mapping procedures. In a small number of pilot experiments, we placed M1 injections by first 1) recording from M1 with electrodes to identify regions responsive to the center of the whisker field, typically whisker C2, 2) microstimulating M1 to evoke movements of whiskers in the center of the whisker pad, such as C2, and 3) flavoprotein imaging of M1 during electrical stimulation of L1 or L2 above the C2 barrel in S1 (Shibuki et al., 2003). Each of these physiological mapping techniques indicated circumscribed subregions of M1 that were already within our stereotaxic windows and, when targeted for infection, subsequently yielded M1 inputs to L2/3 that were <2 mV in peak amplitude. Consequently, we used only stereotaxic location for placing subsequent M1 infections. After ~3 weeks of viral expression, animals were prepared for physiology experiments as described below. Light-activation of infected fibers was achieved by placing a 200 μm fiber optic immediately above a craniotomy over barrel cortex and delivering isolated 10 ms pulses of 473 nm light using a DPSS laser (OEM) controlled by a mechanical shutter. Fiber output (~38 mW) was checked between experiments using a power meter. We measured the average light response of a neuron with 20–40 trials of light stimulation with 2 s interstimulus intervals. 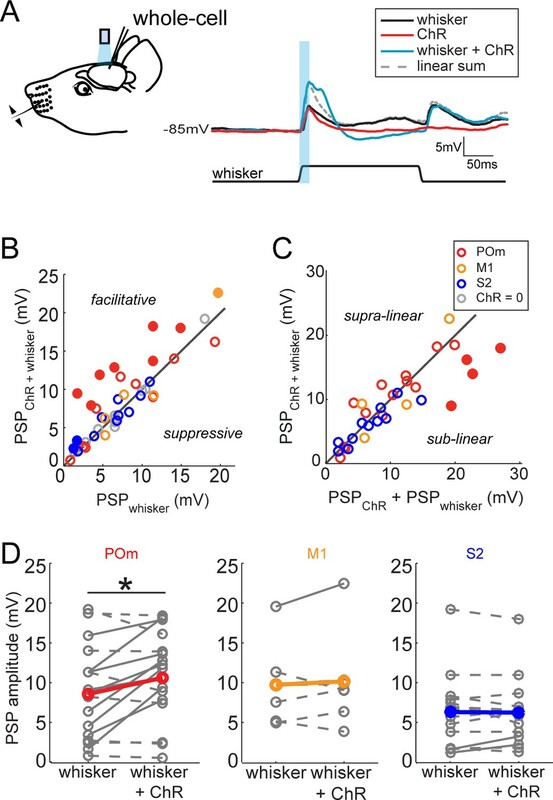 For combined light and whisker stimuli, onset of whisker stimulus precedes the light stimulus by 7 ms (approximate synaptic delay from periphery to L2/3), to maximize the coincidence of whisker- and light-evoked potentials arriving in L2/3. In all cases, animals were initially anesthetized with isoflurane (1–3% in O2). Body temperature was kept at 37°C by a heating blanket. Eyes were coated with lubricating ointment to prevent drying. The parietal and occipital bones were exposed, and a metal post for positioning the head was attached to the skull using dental acrylic. The parietal bone overlying left barrel cortex (centered 2.5 mm posterior to bregma and 5.5 mm lateral of the midline) was thinned with a dental drill until transparent, and small craniotomies (<0.5 mm2) were made over the thinned region. The dura was removed. For urethane anesthesia experiments, 74 female Wistar rats (150–250 g) were used. After the above surgery was complete, animals were administered urethane by IP injection (0.9–1 g/kg). For sedation experiments, 12 rats were additionally prepared as described previously (Bruno and Sakmann, 2006). Briefly, cannulae were inserted into the trachea (for mechanical ventilation), femoral artery (for blood pressure monitoring) and jugular vein (for drug infusion). Screws were inserted in the right frontal and parietal bones for electrocorticogram (‘EEG’) recording. All wounds were infiltrated with bupivacaine. Fentanyl (~10 μg/kg/hr) and pancuronium bromide (1.6 mg/kg/hr) were continuously infused after discontinuation of general anesthesia, and rats were ventilated (90–100 breaths/min). Mean arterial blood pressure was typically ~120 mm Hg. Four animals were prepared for the anesthetized-awake preparation as described previously (Constantinople and Bruno, 2011). Prior to making craniotomies, screws were inserted in the right frontal and parietal bones for electrocorticogram (‘EEG’) recording. Instead of switching to urethane or fentanyl, animals remained on isoflurane anesthesia. Rats were wrapped in a blanket and secured in a plastic tube to reduce movement. The local anesthetic bupivacaine (0.5%) was regularly applied to the area of the head surrounding the acrylic. To avoid startling the rat, a black curtain was placed around the air table, and noise in the lab minimized. Patch pipettes (4–7 MΩ) were pulled from borosilicate glass and tip-filled with (in mM) 135 K-gluconate, 10 HEPES, 10 phosphocreatine-Na2, 4 KCl, 4 ATP-Mg, 0.3 GTP, and 0.2–0.4% biocytin (pH 7.2, osmolarity 291). Pipette capacitance was neutralized prior to break-in, and access resistance was 10–60 MΩ. Recordings were digitized at 32 kHz. Similar pipettes were used for juxtasomal recording of POm neurons. Juxtasomal pipettes were filled with 4% biocytin in aCSF (in mM: 135 NaCl, 5.4 KCl, 1.8 CaCl2, 1.0 MgCl2, and 5.0 HEPES; pH 7.2). After acquiring single-unit data, we attempted to fill the recorded neurons by injecting square current pulses (1–3 nA, 250 ms on, 250 ms off) for several minutes. LFP pipettes (2–3 MΩ) were filled with aCSF. LFPs were bandpassed 1–325 Hz. Pharmacological inactivation of POm: 90–100 nL of muscimol (1 mg/mL) or Lidocaine (10%) was injected over ~20 min using a Nanoject II auto-nanoliter injector (Drummond, Broomall, PA). LFP recordings were obtained ~30 min post injection. Individual whiskers were deflected using multi-directional piezoelectric stimulators. Whiskers were positioned inside the stimulator ~10 mm from the base of the hair and deflected 5.7° (1 mm amplitude) using relatively high-velocity (onset and offset: ~570°/sec) ramp-and-hold movements. Deflections were applied randomly in each of eight directions, in 45° increments relative to the horizontal alignment of the rows. A receptive field was mapped by applying 10–20 blocks of such stimuli (80–160 total stimuli with 2 s interstimulus intervals). After recordings, rats were deeply anesthetized and perfused transcardially with cold 0.1 M sodium phosphate buffer (PB) followed by 4% paraformaldehyde. The left barrel cortex was cut tangentially in 100 μm sections to the white matter. The rest of the left hemisphere was sliced coronally in 100 μm sections. Tangential sections were stained with streptavidin conjugated to Alexa 594 (Life Technologies) to visualize recorded neurons. In tangential and coronal sections, ChR2-eYFP signal was amplified by using a rabbit anti-GFP primary antibody (at 1:1000, incubated overnight in 5% normal goat serum and 1% Triton-X in PB at 4˚C) and a goat anti-rabbit-Alexa488 secondary antibody (at 1:200, for 2 hr in 5% normal goat serum and 1% Triton-X in PB at room temperature, Invitrogen). Using epifluorescence or confocal microscopy, we confirmed the presence of infected somata in the targeted brain region and infected axons near recorded S1 neurons. The location of a L2/3 cell relative to its barrel center was measured by 3D reconstruction in Neurolucida (MicroBrightfield). The radial trunk axons of the recorded L2/3 neurons were visibly well filled in the L4 sections. Its location was marked, and the borders of the L4 barrel it passed through were traced. The horizontal distance between the axon and the centroid of the barrel borders were then measured in the same section. Required n was estimated prior to the study by standard power analysis assuming an effect size (difference in PSP amplitudes) of 2 mV, SD of 1.5 mV, and 80% power, suggesting a minimum n of approximately 10 neurons per group. No outliers were excluded. Data were analyzed using custom Matlab routines. Initial and persistent depolarizations to photostimulation were measured from the mean trace. Persistent depolarization was classified as present/absent by testing whether the maximum over 150–1000 msec following the laser pulse onset was statistically significantly different from a 100-msec period preceding the laser pulse. The onset of the persistent response is defined to be the time at which the trace crosses the baseline value (prior to the laser pulse) in a positive direction after the IPSP. The offset is defined to be the time at which the trace returned to baseline. Parametric tests were used for data that appeared Normally distributed. Nonparametric tests were used otherwise. Spectral analysis was performed with Chronux. DC was subtracted from Vm prior to spectral analysis. The Journal of Physiology 553:243–265. The Journal of Comparative Neurology 265:409–427. The Journal of Comparative Neurology 390:297–310. The Journal of Comparative Neurology 319:66–84. Journal of Comparative Neurology 311:405–424. Somatosensory & Motor Research 10:1–16. The Journal of Comparative Neurology 217:357–375. The Journal of Physiology 549:919–927. Frontiers in Cellular Neuroscience 8:76. The Journal of Comparative Neurology 324:427–448. Journal of Comparative Neurology 464:98–103. Thank you for submitting your work entitled "Higher-order thalamus, but not cortex, strongly activates primary somatosensory cortex" for consideration by eLife. Your article has been reviewed by three peer reviewers, and the evaluation has been overseen by a Reviewing Editor (BRE) and a Senior Editor. The following individuals involved in review of your submission have agreed to reveal their identity: Mathew E Diamond (Reviewer #3). (Reviewer 2) Location of PO thalamus: The input to "Barrel" cortex from PO thalamus lies at the approximate ventral edge of PO thalamus, which abuts VPM thalamus. Thus it is a matter of necessity to show all injections and carefully verify the injection sites. We note that Cyt-ox staining, which highlights VPM over PO thalamus, is an effective means of demonstrating the border. (Reviewer 1 and Reviewer 2) The need to use VPM input as a baseline level: All inputs are noted as weak in the manuscript. This should be relative to the dominant input to the whisker column, which comes from VPM thalamus. These data would also provide strong contact with a larger body of past literature. (Reviewer 1) Extreme hyperpolarization of cells in cortical layers 2/3: As noted by reviewer 1, these intracellular voltage levels appear aberrant and "could have the effect of making the cortical neurons hyperexcitable and therefore over-represent the sensory gating phenomenon". This needs to be checked and explained. (Reviewer 2) The extent of activation of CHR2 as a function of depth needs to be addressed. In this regard, the authors may consider the use of C1V1, ReaChR, or Chrimson to improve the depth dependence of cortical activations of inputs for L2/3 cells. We appreciate that considerable time and effort may well be involved in forming experiments to address these issues. While rejecting your paper in its current form, the editors would be open to reconsidering a thoroughly augmented manuscript as a new submission given the overall interest in the topic and potential for the results. Zhang and Bruno show that the higher-order whisker thalamus POm provides potent excitatory input to layer 2/3 neurons in the primary sensory barrel cortex, such that POm input coincident with sensory (whisker stimulation) input evokes spiking in layer 2/3. The functional "gating" of L2/3-a cortical layer so often studied but so difficult to make spike-by POm is an exciting and profound finding, and is an important step towards understanding thalamocortical interactions during sensory processing. The report that POm's effect is largely excitatory despite projections to inhibitory L1 is surprising from a purely anatomical point of view and is in agreement with recent functional demonstration of the excitatory role of the POm to S1 pathway. Furthermore, the presented results contrast the strong POm effect to the weaker effect of cortical inputs from S2 and also from motor cortex. Zhang and Bruno further strengthen POm's role in providing excitation on long timescales and they built on these findings by demonstrating that POm-specific effects are seen in sedated and awake but not anesthetized animals, which the authors suggest as a possible mechanism for cognitive functions, e.g. memory and learning. In addition to addressing the very timely issue of the role of higher-order thalamus on cortical dynamics, the experiments are of high quality and are well designed and controlled. 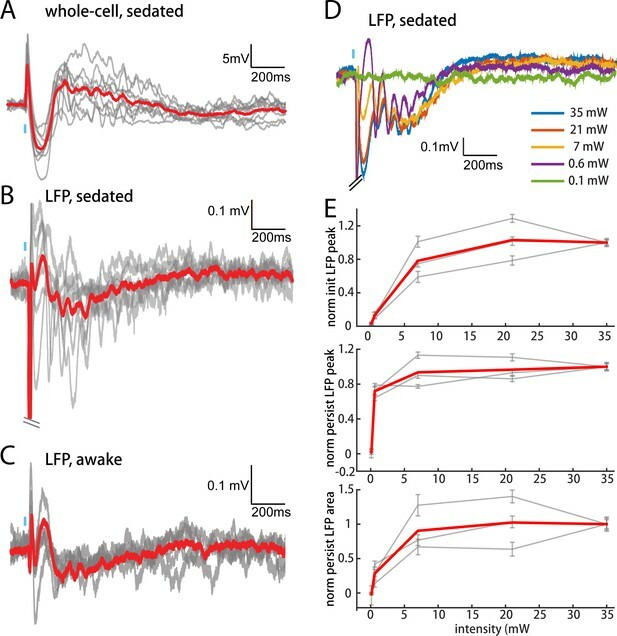 The study combines single-cell electrophysiology, anatomical techniques, and optogenetic and pharmacological manipulation of the circuits in question in anesthetized and sedated rats, as well as LFP measurements in awake rats. The paper is clearly and concisely written and for the most part, data and analysis are well presented and summarized. However, I have a few questions regarding basic aspects of the data and analysis, which make some findings difficult to interpret, along with some other points which would strengthen and clarify the paper. 1) The membrane potentials shown in Figure 2 seem quite hyperpolarized – well below -80 mV for each case in the example raw data, and in the summary plot, approximately half of the recordings have baseline potentials of less than -75 mV and approximately one quarter have baseline potentials well below -80 mV. Perhaps I missed it, but I could not find comments in the manuscript on these low RMPs, which seem surprising especially in vivo, even when assuming strong and tonic inhibition of these circuits. • My concern is that this level of hyperpolarization could have the effect of making the cortical neurons hyperexcitable and therefore over-represent the sensory gating phenomenon, if it is due to some effect of the preparation which also affects juxtasomal spike recordings and not only whole-cell recordings. Did the authors obtain any preliminary data on POm's effects on neurons in other layers for comparison? • If any whole-cell spiking data showing the combination of whisker stimulation and POm input was collected, was there a correlation between the magnitude of sensory boost and baseline membrane potential? If possible, it would also be useful to plot the reversal potential of POm inputs from single to investigate mixed inhibition and excitation. 2) The stimuli – both whisker and optogenetic Pom – are not particularly physiological. Especially given the lab's previous use of dynamic, more complicated stimuli, it would be useful to indicate how one can extrapolate from the present results to more realistic patterns of input. This issue seems particularly relevant for the POm input and long timescale effect, as the authors state that they attempted to introduce ChR into as much of the nucleus as possible; therefore the light stimulus will presumably induce massive synchronized spiking in POm. It is an interesting point that the long timescale effect seems to be all or none, in contrast to the more graded initial effect, but it is hard to interpret what this widespread activation of POm (and POm's additional inputs e.g. in motor cortex and S2) would mean for more precise patterns of activity vs. the network being driving into an extreme of oscillatory behavior. 3) Based on anatomical overlap alone, the three regions could equally cause "gating," as mentioned in the Discussion. However, the functional findings point to a situation where "Peter's rule" does not apply. The authors do discuss some reasons for the discrepancy, but this discussion should be expanded upon especially in light of functional predictions from anatomical data (bouton/dendrite overlap) in the literature. 4) As Figure 1A shows that the axonal density in L2/3 varies considerably, it is surprising that there was no significant correlation between EPSP amplitudes and the recorded neurons' locations with respect to these septal patches. Did the authors check the relative amount of YFP fluorescence surrounding the recorded neurons)? If EPSP amplitude doesn't covary with expression in L2/3, then doesn't this suggest that the input goes into the tuft? In this study, the authors use mainly optogenetic techniques to test the relative strength of three inputs to cells of the rat's barrel cortex. The inputs are from M1, S2, and POm. They conclude that the POm input is strong and the others, weak. Although the methodology is fairly straightforward, there are just too many flaws, of varying seriousness, to recommend publication. Poor experimental design allows many alternative explanations for the results, many of which are uninteresting. While each problem alone might be fixable, the sheer number is daunting. 1) Interpretation of the data requires that the ChR2 be placed accurately. This is especially important for the POm activation. POm abuts VPM, and so any spillover could mean that VPM inputs were also activated, which would completely invalidate the results. The documentation for this (Figure 1A lower) is completely inadequate. The injections sites need to be shown for every case and the border between POm and VPM must be defended and illustrated. 2) The photoactivation is applied to the surface of cortex. How deep does it penetrate? Are only layer 1 terminals hit? According to Figure 1B, the main peaks are 1mm down in barrels. Are terminals there stimulated? However, Figure 1A shows that POm dominates septa in upper layers (a Figure 1B version of septa would be useful), and these POm fibers would be selectively activated by the photostimulation. Thus an uncontrolled variable would activate many more septal terminals from POm, and only if such activation does not affect the recordings in barrels would this not be a problem. This seems a dubious point at best. 3) The authors repeatedly refer to POm input as "strong", "potent" and: "Only POm inputs appeared sufficient to drive L2/3 neurons…" Actually, the data do not support very strong input here. It seems more appropriate to describe this input as the least weak among the three tested. One would expect the VPM input to be strong, and if they wish to make such claims, they should compare the POm to VPM inputs (see also below). 4) In the third paragraph of the subsection “POm facilitates sensory responses of L2/3 pyramidal neurons”, the authors describe the location of recorded cells with respect to barrel centers. How was this determined? 5) Figure 7B makes no sense to me, which may be my misreading, but I do find it worrisome. If I understand correctly, photostimulation of the axons in cortex leads to an antidromic spike that is seen in the left histogram, but why is none seen in the right, even if background firing is reduced. Why should anesthesia affect antidromic activation? Also, if one antidromically activates thalamocortical cells as I assume is done here, one should see a monosynaptic early peak (as in the left histogram but not the right) followed by a disynaptic dip due to activation of TRN cells that would inhibit the recorded cell. This dip is missing in the left histogram. Why? 6) The authors state, "POm was targeted by physiologically locating the C and D whisker row representations…," presumably maximizing the connectivity with barrel cortex. No mention is made of similar alignment procedures for the M1 or S2 inputs, raising yet another uncontrolled variable that could explain the apparent greater strength of the POm input. 7) Figure 5 curiously includes VPM stimulation. This is odd and troubling to say the least. No mention of methodology here and no reference to relative VPM strength as suggested in point #3 above. On this interesting and solid manuscript I would not recommend any additional experiments but would suggest some optimization of the presentation. Abstract – "Layer (L) 2/3 pyramidal neurons in the primary somatosensory cortex (S1) are sparsely active, spontaneously and during sensory stimulation." Introduction – "Layer (L) 2/3 pyramidal neurons in the primary sensory cortices exhibit sparse activity, both spontaneously and in response to sensory stimuli (Barth and Poulet, 2012). Even in awake animals performing tactile detection tasks, L2/3 firing probability remains low and is substantially lower than that of most other cortical layers (O'Connor et al., 2010)." And even the outset of Discussion – "L2/3 pyramidal neurons in the rodent barrel cortex are sparsely active under a large range of conditions, including when awake animals perform simple tactile tasks." But then in the Discussion, in the third paragraph of the subsection “Persistent Depolarization”, all the emphasis is on the significance of persistent activity in superficial layers which seems discordant with the preceding sections. The phrasing in various sections could be reworked a bit to make the Discussion more harmonious with the earlier sections, or vice versa. 1) – Abstract, Introduction. Layer 2/3 cells fire sparsely. 2) Results. POm stimulation can depolarize the cells and cause them to fire (Figure 4D and E in particular). 3) Discussion. Well, we already knew that in certain behaviors there is widespread long-lasting depolarization in L2/3, which disagrees with 1. The authors also ought to discuss the ramifications of POm's possible dependence on descending projections from barrel cortex for its own excitability (as indicated in much older literature, at least in the anesthetized brain). If that circuit – which by the way should not be lumped together with Sherman's view of POm in cortex-to-cortex communication – operates in the awake animal, it means that POm would require a descending input from layer 5 to get significantly excited (perhaps due to convergence with slower ascending trigeminal inputs) and that POm's firing would then allow subsequent excitation of cortical layer 2/3. Whether the above summary is accurate, or whether a more likely scenario can be depicted, the authors should address this issue of the temporal flows of excitation suggested by their work. Thank you for submitting your article "Unique properties of high-order thalamic inputs versus cortical inputs to primary somatosensory cortex" for consideration by eLife. Your article has been reviewed by three peer reviewers, and the evaluation has been overseen by Ronald Calabrese as the Senior and Reviewing Editor. The reviewers have opted to remain anonymous. The manuscript is substantially improved over the last version, with the major scientific and technical concerns resolved. The authors study how cortical and thalamic input can modify S1 L2/3 responsiveness and conclude that secondary thalamus (POm) can open a long-duration window of enhanced L2/3 responsiveness, while inputs from cortical M1 and S2 is relatively weak. From a conceptual point of view, this is important work, since we still are just at beginning stages to understand thalamo-cortical circuitry. There are still a few issues that need to be addressed by revision but they need not necessitate re-review. 1) The remaining experimental concern is whether a direct comparison between S2, M1, and POm is wholly warranted. We are satisfied that the authors can detect whether POm inputs are well-labeled, but are less convinced by their ability to target the anatomically correct region of S2 and M1 with saturating levels of ChR2 expression. S2 in particular is a broad region, and injections that are slightly off the barrel column analyzed (for PW stimulation) will result in weak light-evoked responses. This is experimentally tough – since every animal will have slightly different experimental coordinates for maximal S2 label in the selected PW), but must be introduced as a major caveat in the interpretation/Discussion of the data. This concern is also the case for M1. 2) Generally, the study is well-conceived and will be of great interest in the field. The first 4 and last 4 figures remain somewhat disconnected, and it would be very helpful to try to draw a more coherent link between the two parts of the study. This is a good point. Our study contains dozens of rats for any one area alone – a complete gallery even at postage stamp size is pages of figures. We have therefore provided a new supplementary figure that contains a gallery of example POm injections that illustrate for the reader 1) the general location we targeted, 2) the size of the POm infection, and 3) the size of VPM contamination, if any. More directly to R2’s point, this figure shows new quantitative analyses of the degree to which intended POm infection versus unintended VPM contamination might produce our results. This new Figure 4—figure supplement 1 and a new Results paragraph document that POm infection size, but not VPM contamination, correlates with the amplitude of synaptic inputs we measured. Thus, VPM contamination cannot account for our results. POm appears to be the main determinant of the large PSPs in layer 2/3. We have refined the text and title to avoid overstating the strength of POm input and frame the work as a relative comparison of different inputs. We also elaborate on the VPM data, providing VPM statistics and pointing out that VPM inputs are ~7 times stronger than POm inputs in terms of the initial peak. The intracellular voltage levels are not unusual of L2/3 cells under these conditions and recorded with reasonably good access resistance for in vivo recording (here, 10-60 MOhm). Our sample of L2/3 whole-cell recordings in urethane-anesthetized rats had a median membrane potential of roughly -75 mV (Figure 2E), which is not extremely hyperpolarized for this cell type under these conditions. Brecht, Roth and Sakmann, 2003, reported a mean of -83 mV for L2/3 cells in urethane-anesthetized rats, and Petersen et al., 2003, reported a mean of -75 mV. The reviewer may be thinking of recent studies using awake, not anesthetized animals. With regards to that possibility, our own lab has shown that this cell type in awake rats is more depolarized, albeit only slightly (to the -70 to -65 mV range), because the protracted down states seen under anesthesia largely disappear during wakefulness (Constantinople and Bruno, 2011). The range (min and max) over which the neurons fluctuate is the same whether the animal is awake or anesthetized. The slightly more depolarized level during wakefulness is precisely why we additionally added the fentanyl sedation experiments, in which the animals are not anesthetized and have membrane potential levels and dynamics as in awake animals. Furthermore, biophysically, the exact level of depolarization would affect all 3 classes of inputs (POm, S2, and M1) equivalently and cannot explain the relative differences in magnitude. All POm axons reconstructed to date have branches in L1 (Deschenes et al., 1998; Ohno et al., 2012; Oberlaender, Ramirez, and Bruno, unpublished data). In the rat, 95% of the motor cortex neurons that project to primary somatosensory cortex have been observed to have branches in L1 (Veinante and Deschenes, 2003). Thus, strong illumination of L1 in S1 is expected to activate virtually all infected neurons projecting to S1. As shown in our study (Figure 7) and as shown by others, activating terminals triggers backpropagating action potentials, which will invade the rest of the axonal tree and soma. In other words, there are few if any additional neurons that can be recruited by increasing light penetration or repeating our entire study (measurements of three different groups of animals) with a red-shifted opsin. Additionally, the original text related to Figure 4B explained that, if POm’s innervation of the septum explained its strong input to L2/3, one would expect to the size of the PSP to be a function of distance from the barrel center. As shown in Figure 4B, this is not the case. […] The paper is clearly and concisely written and for the most part, data and analysis are well presented and summarized. However, I have a few questions regarding basic aspects of the data and analysis, which make some findings difficult to interpret, along with some other points which would strengthen and clarify the paper. Because the editor felt this was a particularly important point, we have addressed it above in response to their summary. As we describe above in greater detail, these values are not unusual. We nevertheless now comment on them and their consistency with previous studies in the Results. We did not examine other layers, but other layers have different passive and active physiological properties (among other differences) and are not a neutral comparison. However, to the reviewer’s main concern, the original submission reported the input resistances of the L2/3 cells (Figure 2F), which were ~40 MOhm on average and typical of other studies. Our L2/3 recordings are not in an unusually hyperexcitable state. We now explicitly comment on this. Figure 4D, E showed analyses of spiking data for combined whisker and POm stimulation versus whisker stimulation alone. However, we detected no significant relationship of the magnitude of the boost in spiking (spiking with laser – spiking without laser) and the baseline membrane potential (linear regression, p = 0.15). This is potentially complicated by the stochasticity of spike generation, the sublinearity of synaptic integration (see below), opposing effects of baseline on driving force for excitation versus inhibition, and cell-to-cell differences in excitation versus inhibition. One likely requires a particularly large sample to detect such effects. As requested, we regressed POm input magnitude against baseline membrane potential. This predicts a reversal potential for POm inputs of approximately -34 mV, suggestive of mixed inhibition and excitation and consistent with other studies of synaptic pathways studied in vivo. We have added this in the Results. We are grateful to the reviewer for raising this interesting question, which we did not expound upon in our original submission. The dynamic, more complicated stimuli that the reviewer refers to is our paper Ramirez et al., 2014, which used an array of whisker stimulators to explore more naturalistic stimulus space in a controlled manner. An extrapolation is indeed possible. Ramirez et al. showed that inputs evoked by each whisker are 1) linearly integrated for small PSPs and sublinearly integrated for large PSPs, seemingly due to cellular driving force constraints (Ramirez Figure 7D), but 2) the effect of surround whiskers is still facilitatory, leading to a net boost over principal whisker stimulation alone (Ramirez Figure 7C). Interestingly, this is exactly the pattern of results we obtained for POm and principal whisker stimulation: sublinear integration that remains net facilitatory (this manuscript Figure 3B, C). In other words, POm input appears to be similar to a sensory input in terms of integration by and impact on L2/3 cells. Because the L2/3 cells do not spike to the various cycles of the POm input – the input alone is subthreshold – the network is not necessarily expected to enter a state of extreme oscillation when additional stimuli are introduced. One would therefore expect that POm would, overall, enhance spiking responses to spatiotemporally complex patterns of whisker stimuli similar to our single-whisker stimuli used here. This is reminiscent of an attention-like enhancement thought to exist for visual pulvinar. Of course, our data do not rule out the possibility that POm could enhance specific spatiotemporally complex patterns and suppress others. This is an interesting hypothesis and worthy of a future study. We now comment on the relationship between these results and our previous study and discuss possible extrapolations. The lack of correlation with distance to the septum, while a result, is understandable: As we discussed in our response to the editor’s summary, all POm axons reconstructed to date branch extensively in L1 (Deschenes et al., 1998; Ohno et al., 2012; Oberlaender, Ramirez, and Bruno, unpublished data) but have little or no branching as they ascend the septum on their way to L1. Additionally, a single axon often has long segments that ascend the septal spaces between more than one pair of barrels. The epifluorescence is therefore misleading in this respect because many unbranched axons are being concentrated into small spaces, creating a strong signal that does not necessarily translate into a complex arbor with many synapses. We now comment on this point. As explained at the beginning of this point-by-point reply, we have provided a gallery of injections and new analyses that demonstrate that VPM contamination cannot account for our results. We addressed this issue in detail in our overall reply. In short, virtually all POm and M1 axons arborize in layer 1 of S1 where the light is most intense. Therefore every infected axon is expected to be activated independent of how little or extensive it arborizes in deeper layers. Additionally, light intensity at a depth of 1 mm in the brain is estimated to be only ~1% of the intensity at the surface (Aravanis et al., 2007). In other words, blue light is likely to be more restricted to L1 terminals than red light, which would increase not decrease variability if it were not the case that virtually all POm and M1 axons branch in L1. We now clarify throughout the text that we are making a relative comparison rather than an absolute statement of strength. We report additional VPM numbers as requested below. The left and right panels illustrate the same cell under two different conditions. Antidromic spikes traveling along an axon are not guaranteed to fire a somatic spike, which would be necessary for us to detect an action potential by juxtasomal recording. Also, like most general anesthetics, isoflurane’s mechanism(s) of action are not fully understood. Isoflurane is known to bind numerous neurotransmitter receptors and likely also indirectly affects the neuromodulatory environment. The anesthesia-induced changes to the intrinsic properties, overall level of hyperpolarization, and possible modulation of active conductances are likely opposing the triggering of somatic spikes in the POm somata. We agree that one would expect TRN-mediated inhibition in POm, though perhaps not necessarily to the extent seen in VPM, which may be what the reviewer is thinking of. One can see a clear period of silence lasting 100-200 ms in many individual trials of the raster plot. However, there are several trials with bursts around the time of the light, which means that the PSTH will lack the empty bins that the reviewer is expecting to see. That is, the average hides what can be seen in individual trials. Moreover, we should underscore that the point of Figure 7 was to show whether or not POm cells were also firing persistently. This was not guaranteed as axonal barrage firing has been described for some types of axons (Sheffield et al., 2011). That is, the axon could be bursting without somatic bursts. We showed this is not the case for POm, which led us to the experiments to test the necessity of POm in the persistent firing phenomenon (Figure 8). S1. These results are also consistent qualitatively similar experiments regarding M1->S1 and S2->S1 inputs from other labs. Variability in virus injection does not seem able to explain our consistent results. Also, in a few pilot experiments, we had targeted injections to M1 by flavoprotein imaging of the cortex while antidromically stimulating their axons in S1. This produced activity spots in the flavoprotein imaging where we would subsequently inject virus. This yielded synaptic input measurements that were similar to the stereotaxic approach, which we subsequently used for the study. We now describe more completely the injection procedures for POm, VPM, S2, and M1. VPM was included in experiments investigating persistent depolarization because POm’s difference from S2 and M1 in inducing persistent depolarization might simply be because it produced strong initial input than S2 and M1. VPM produces an even stronger initial volley and could therefore control for this possibility. As reviewer 1 noted, this is a nice control. We now motivate our use of VPM more clearly. We also added more technical detail of VPM injections to the Materials and methods and compare the initial volleys for POm to VPM in the Results. 1) Abstract, Introduction. Layer 2/3 cells fire sparsely. First, we see that our exposition inadvertently created some confusion between persistent depolarization (a window of enhancement during which a cell is more likely to respond to a subsequent input) and persistent activity (a window during which a cell IS firing more). We had used the terms “persistent response” and “persistent depolarization” interchangeably numerous times throughout the text. “Response” of course connotes suprathreshold firing, which is not what we meant to convey. We now only use the term “persistent depolarization” with regards to L2/3. We also clarify that this is a window of enhanced opportunity for L2/3 responses, not that L2/3 is necessarily firing throughout this time. The whisker representation in S2 is actually not a broad region: Whisker S2 measures only ~0.5 mm wide and lies directly lateral to the whisker representation in S1 (Carvell and Simons, 1987; Fabri and Burton, 1991; Kwegyir-Afful and Keller, 2004). S2 is therefore roughly the same size as POm. A size difference leading to limited S2 coverage cannot explain the apparent input difference and bolsters our case for a comparison. Furthermore, a recent study in the mouse shows that, while S2->S1 connections have a topographical organization, the organization is very loose (Minamisawa et al., 2018): any small (<100 micron wide) location in S2 projects to an S1 region on the order of a magnitude larger. Thus, our larger (hundreds of micron wide) viral infections of S2 would provide even more expansive coverage of S1. Similarly, M1 is a broad region, but the area that provides S1 feedback is more limited in size. Because we were unconcerned with contaminating surrounding structures in the case of M1 (unlike POm and S2), we could blanket M1 with multiple viral infection tracks. We did try flavoprotein imaging, microstimulation, and electrophysiological recording in attempts to optimize the placement of M1 injections, but these targeted infections never resulted in POm-like input strengths in M1 experiments. We therefore used the simpler approach of making multiple viral infection tracks to ensure that, even if a topographically special location within M1 existed, we would not miss it. To address this issue, we have added 2 paragraphs to the Discussion addressing these points. We also mention in the Materials and methods that we tried various techniques for identifying potentially optimal M1 infection sites but they never yielded such large inputs as we observed for M1, prompting us to proceed with stereotaxic M1 experiments. The conceptual points of the figures are as follows. Figure 1-3: POm inputs appear stronger than S2 and M1 inputs under anesthesia. Figure 4: This is true under both anesthesia and sedation, a very different state that well approximates wakefulness. Figure 5: Under this condition, POm but no other areas can trigger a persistent depolarization. Figure 6: The same persistent depolarization exists during wakefulness and is all-or-none. Figure 7: The difference is likely due to the massive effect of state on POm dynamics. Figure 8: POm sustained firing during the sedated and awake conditions are required for the long-lasting depolarization. Thus, POm input differs from cortical inputs in terms of its strength, time course, and oscillatory signature. We find the progression here logical. Nevertheless, to address the reviewers’ concern, we have retitled the paper (see also reviewer 3’s first comment). We have also tweaked the Results text transitioning from one figure to the next as well as the figure titles to amplify this narrative. We thank Michael Shadlen, Chris Rodgers, Amanda Kinnischtzke, Y Kate Hong, Akash Khanna, and Georgia Pierce for comments on the manuscript. We thank Drew Baughman for technical support. This project was supported by NINDS RO1 NS069679, NINDS R01 NS094659, the Klingenstein Fund for Neuroscience, and the Rita Allen Foundation (RMB). Animal experimentation: This study was performed in strict accordance with the recommendations in the Guide for the Care and Use of Laboratory Animals of the National Institutes of Healths. Experiments were performed according to protocols approved by the Institutional Animal Care and Use Committee of Columbia University. (protocols AC-AAAD0960 and AC-AAAF9003).